Notorious prisoner Charles Bronson, who now goes by the name Charles Salvador, has been found not guilty of attempted GBH at HMP Wakefield. Notorious prisoner Charles Bronson has been cleared of attempting to seriously harm a prison governor. Bronson, 66, was said to have lunged at Mark Docherty as he entered a room for a welfare meeting at HMP Wakefield on January 25. He landed on top of Mr Docherty and screamed "I will bite your f***ing nose off and gouge your eyes out", before prison officers intervened and restrained him. 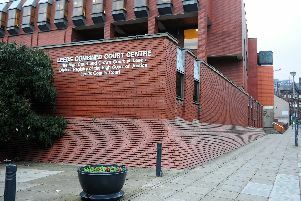 Representing himself at Leeds Crown Court, Bronson claimed he had intended to give Mr Docherty a "gentle bear hug" and whisper in his ear, but tripped, or was tripped by someone, and fell. The defendant admitted he partly blamed the governor at Wakefield's segregation unit after he was told photographs of his prison wedding to actress Paula Williamson two months earlier would no longer be allowed to leave the jail until his release. Bronson said he intended to whisper "where's my wife's photos?" in what he described as a "wake-up call" to the governor to not mess with his family. Jurors found Bronson not guilty of attempting to cause grievous bodily harm with intent, after deliberating for just short of three hours on Thursday. Leeds Crown Court had heard that before his wedding to actress Paula Williamson at the prison in November 2017, Bronson had been told he and his new wife would be given 22 wedding photographs, all taken by prison staff, but that Mr Docherty later changed his decision. The 66-year-old defended himself during the trial and his colourful approach saw him sharing stories about his life and fellow prisoners with the jury. He told the jury that he would never have tried to bite the prison governor as he is a vegetarian, before saying he had wanted to bring serial killer Robert Maudsley, known as Hannibal the Cannibal as a witness. Bronson also told the jury that he had been an unlicensed fighter in the past and had won all six fights he had took part in, including one with a Rottweiler dog. Now known as Charles Salvador, Bronson admitted doing "nasty" things in his past but told the jury: "For the first time in 66-years living on this planet I am an innocent man and may British justice do me proud. Thank you."